Monday and Tuesday Museum is closed for public. 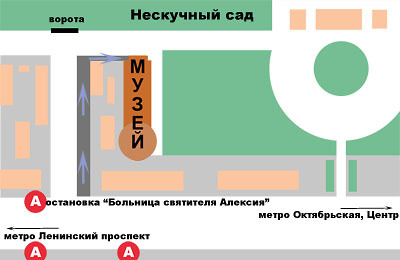 From the subway station "Oktyabrskaya" take any trolleybus or bus (except #144)to the stop "Bolnitsa Svyatitelya Aleksia" then follow the path on the sketch map. From the subway stations "Leninskiy Prospekt" or "Ploshchad' Gagarina" take any trolleybus or bus (except #144) to the stop "Bolnitsa Svyatitelya Aleksia" then cross Leninskiy Prospekt street using underground cross and then follow the path on the sketch map. FREE ENTERANCE FOR EVERYBIDY IN EACH FIRST AND LAST WEDNESDAY OF EACH MONTH. 1. Group of 1-5 people 2000 rubles. 2. Students, active military staff, senior citizens of special categories, (groups of 5-15 people)	2500 руб. 3. Смешанная группа: совершеннолетние граждане, не попадающие в состав льготной группы посетителей, и школьники, студенты, учащиеся, группой 5-15 человек. 3000 руб. 5. Guided tour in a foreign language (English, Deutsch) for groups up to 15 people	5000 rubles. The guided tours price schedule is valid for the groups registered in advance. In case of tour ordered at the same day (if available) the additional 500 rubles surcharge will be applied for the tours on Russian and 1000 rubles surchage for the tours on foreign language. In case of more then 15 people in the group (but not more thah 17) the enterance ticket should be purchased for each additional person. To order, confirm, change the date or time or cancel the tour call phones: (925)-246-6282, or (916)-629-8052. The cost of any event outside of working hours starting from 20 000,00 rubles.